We were very fortunate to have a sunny day before Easter Monday's storms - and a healthy number of visitors came to our regular 'start of season' event. 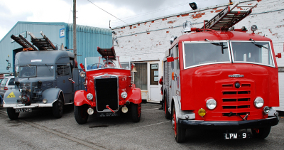 Seven of the Museum's cars took to the road and were kept busy offering rides, and 28 buses and coaches, ranging from 1920s to the 1990s, operated our park and ride service and regular services to Lincoln city centre and to Doddington Hall and the Natural World Centre, Whisby, as well as local tours - including the chance for a 'bracing' ride on the Grimsby - Cleethorpes open top bus! The Society's car fleet awaiting action. Some of the Museum's buses between journeys. The Museum's motorcycle fleet along with some members' bikes. 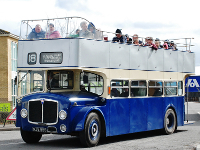 former Grimsby-Cleethorpes AEC Bridgemaster on a local tour. Thanks to Brook & Mayo for sponsoring the event programme. Our thanks also to Morrisons, Tritton Road, Lincoln; Asda, North Hykeham, and Lincoln Business Improvement Group for allowing us to display vehicles in prime locations before the event to promote our open day. Report and pictures from past open days - November 2015 - Easter 2015 - November 2014 - Easter 2014 - and some videos of past events on YouTube can be seen here.